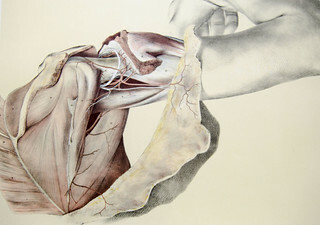 Plate 5 (shoulder) from George Viner ELLIS's Illustrations of dissections in a series of original coloured plates the size of life, representing the dissection of the human body by George Viner Ellis and G. H. Ford London: James Walton, 1867). This volume of lifesize plates states 'The drawings are from nature and on stone by Mr Ford from dissections by Professor Ellis'. The plates were published 1863-1867 and are signed G.H. Ford (George Henry Ford, 1808-1876). This one, of 'The shoulder, and the muscles at the back of the scapula' is undated. The graphically lifelike drawings, reproduced by chromolithography, are reckoned to be some of the best anatomical artworks and show exactly how the dissected body has been manipulated for the drawings. Ellis (1812-1900) was Professor of Anatomy at University College London from 1850, following Richard Quain (the cousin of Jones Quain) and this work was successful enough for a second edition in 1876 (1882 in New York). The plates were published with a separate smaller text volume of descriptions.